A richly-robed elderly gentleman, a grandfather perhaps, is seated in the foreground of the card. He is surrounded by family and his dogs stand loyally by his knee. 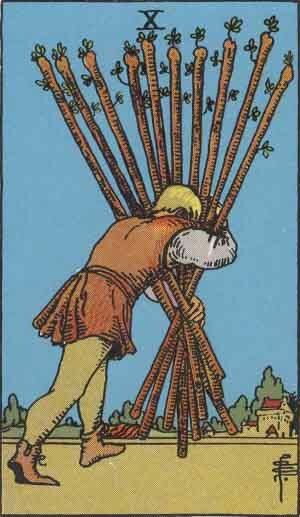 His castle and estate look well established and a sense of material security is well illustrated by the ten pentacles floating through the air. This card symbolizes financial stability and firm foundations for home and family life. It suggests property acquired for the founding of new generations or traditions being passed down in the family with a feeling of continuity and security. A materially settled way of life is indicated. Downton Abbey has it all. A big manor house in the country, masses of land, tons of servants, beautiful possessions, wealth, themes of marrying for money and position, jolly nice clothes not to mention plenty of shots of dogs running at their master’s heels. And standards. Standards are taken veeeery seriously. One must wear the correct coat to dinner mustn’t one. Whole story lines are written around minor breeches of etiquettes. It’s a lot of fun to watch. For other Downton Abbey fans out there I have 2 entertaining sites to share. One is a Downton Abbey episode written up as a Facebook home page. You can find that here: http://www.happyplace.com/21258/downton-abbey-facebook-recap-season-3-episode-6. Note: Don’t read it if you haven’t seen episode 6 in season 3 and hate spoilers. The other is a video clip featuring characters from Downton Abbey edited to appear to be singing/speaking One Direction’s song ‘What Makes You Beautiful’ which you can find here: http://www.youtube.com/watch?v=0TegWM9Z8Jc. Both sites are also available on my Facebook page. Enjoy!